There is a war taking place along the Mississippi River, and we’re losing. Illinois state wildlife officials have gone to great expense in an attempt to keep the bighead carp, a native of Asia that is one of the most invasive species of fish on the planet, out of the waters of the Great Lakes. In December, they spent $3 million dollars and organized a massive river poisoning, then put up an electric barrier fence. Guess what was found on the supposedly-clean side of the barricade? Asian bighead carp, three or four years old, caught in Lake Calumet. Bighead carp, and carp in general, can live anywhere. That’s what makes them so dangerous to native species. If they make it to the Great Lakes, kiss commercial fishing in that area goodbye. 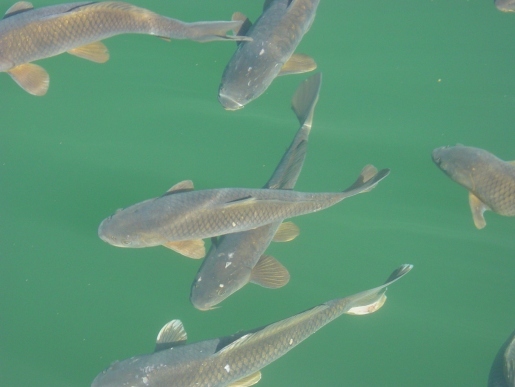 The carp, which can grow up to 4 feet long and weigh 100 pounds, are also fond of jumping into boats, knocking over skiiers, and generally being a threat to all life everywhere near the water. All this trouble, just because Asians love freshly killed fish at dinner.